Last year (2015), I was making a video on “Baby Gender Predictors”, BOY or GIRL? 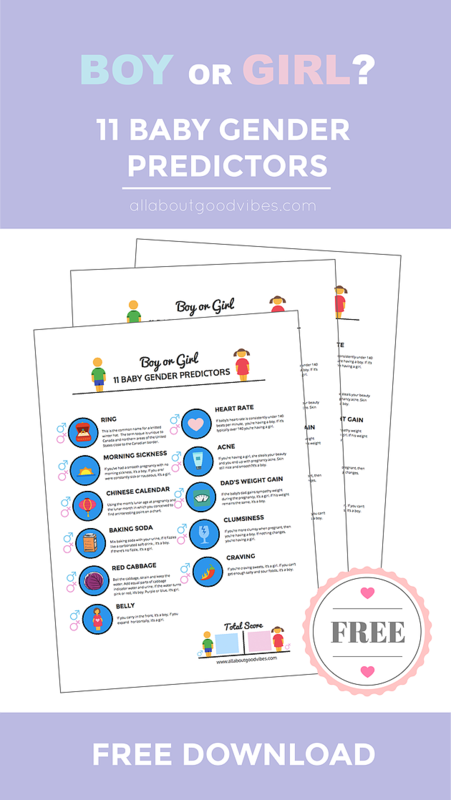 I 11 Baby Gender Predictors with a Free Printable Download and it became my most popular, most viewed video on my channel. So I decided to make an updated version of the Free Printable Sheet that looked a little bit more clean and had space so you will be able to put your results in it too. 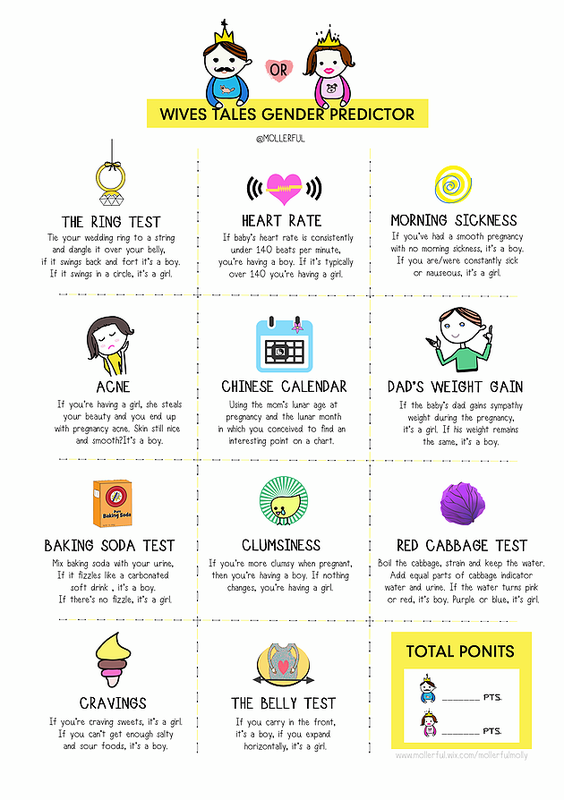 I recommend that you do these 11 tests because it will give you an exciting feeling, a little kick of a joyful moment before you find out about your little one’s gender and get real big joyful tears. You can grab your free printable sheet here or click on the picture below. Don’t take it so serious, just do it for fun, like I said in my video, you will love your baby no matter what gender they are! “Better to be the one who smiled than the one who didn’t smile back.” — Christi Paul. A week a go before I found out my baby’s gender, I did some experiments to find out that my baby is a BOY or GIRL? I’ve picked 11 diferrent old wives’ tales predictor tests. Tie your wedding ring to a string and dangle it over your belly, if it swings back and fort it’s a boy. If it swings in a circle, it’s a girl. If baby’s heart rate is consistently under 140 beats per minute, you’re having a boy. 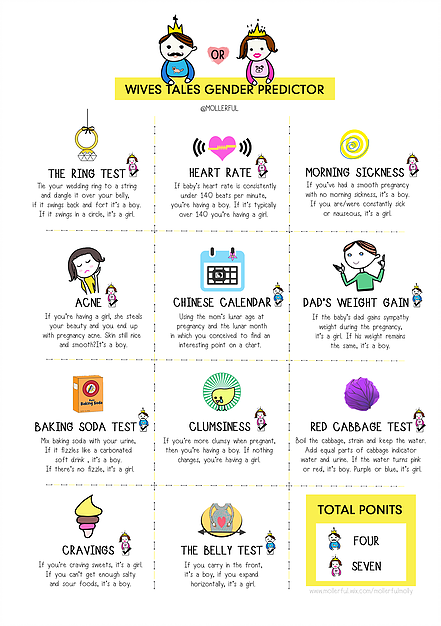 If it’s typically over 140 you’re having a girl. If you’ve had a smooth pregnancy with no morning sickness, it’s a boy. If you are/were constantly sick or nauseous, it’s a girl. If you’re having a girl, she steals your beauty and you end up with pregnancy acne. Skin still nice and smooth?It’s a boy. interesting point on a chart. the same, it’s a boy. Mix baking soda with your urine, If it fizzles like a carbonated soft drink , it’s a boy. If there’s no fizzle, it’s a girl. If you’re more clumsy when pregnant, then you’re having a boy. If nothing changes, you’re having a girl. Boil the cabbage, strain and keep the water. Add equal parts of cabbage indicator water and urine. If the water turns pink or red, it’s boy. Purple or blue, it’s girl. If you’re craving sweets, it’s a girl. If you can’t get enough salty and sour foods, it’s a boy. If you carry in the front, it’s a boy, if you expand horizontally, it’s a girl. Total points: Boy got 4 ponits and Girl got 7 points. It looks like I may have a baby GIRL!! Please wait to find out soon!! Here is the conclusion chart, you can download it for free and write your own results! 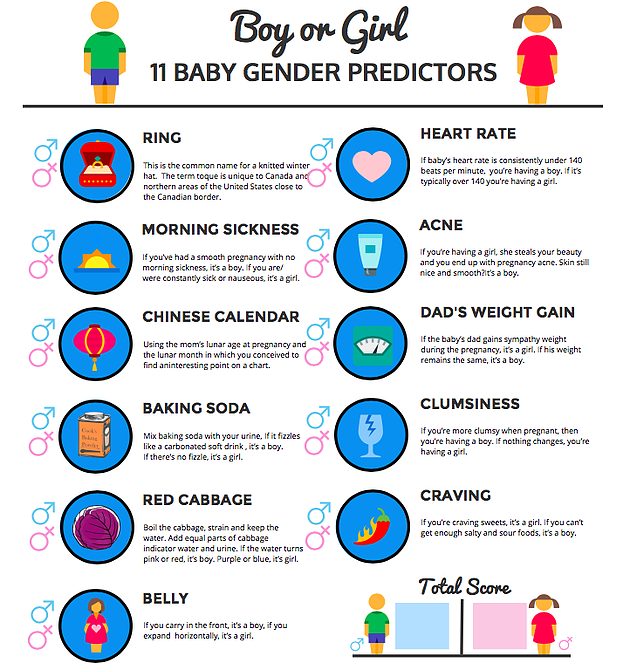 You can use this chart for your gender reveal party or for decoration, this is up to you! Thank you agian for visiting my Mollerful Blog, I hope to see you again next time! The 11 Baby Gender Predictors video is right here.